“Do phoebes raise more than one brood a season? asks Flo Vannoni of Redding. Many species have more than one brood in a season, as Mary Walsh of Ridgefield – who sent the accompanying shot of a second-brood bluebird chick – can attest. “The baby bluebirds fledged last week from a nesting box on my property,” Mary wrote July 14. “It is the second brood this summer. Flo wondered whether her phoebes would start another nest. They probably would, and perhaps in the same location since they would likely have used the old nest a second time. Eastern Phoebes are very loyal to nesting location. They not only use the same nest for their two broods in a season, but also tend to re-use it for several years. That is relatively unusual among songbirds, most of whom build new nests every year. Phoebes simply make repairs and spruce up the previous year’s nest – “waste not, want not” is apparently the motto of this avian recycler. For many songbirds, whose offspring hatch relatively quickly and don’t take long to fledge, having two broods in a season in this part of the country is normal. There is plenty of time to raise two families, and then fatten up for the migration south or, for many year-round species, to stock up on food for the winter. Studies have found that northern birds of a given species tend to have fewer broods than southern birds, yet all produce around the same number of young per season. In the North, for instance, Eastern Bluebirds typically have two broods. In the South, because the warm, insect-filled season is longer, bluebirds often have three broods. Nevertheless, both northern and southern bluebirds produce about the same number of offspring per season because bluebirds in the North lay more eggs per brood than bluebirds in the South. 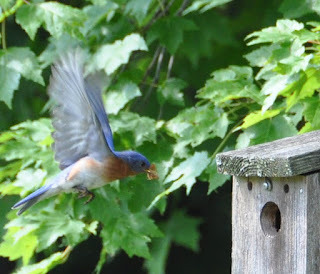 A pair of Connecticut bluebirds might have two nestings, each with five babies, while a North Carolina bluebird couple might have three nestings with three eggs each. The result is about the same. Did the southern birds work harder? They had more nestings, but fewer mouths to feed at each. Moreover, they probably did not migrate as far, if at all, to set up home.